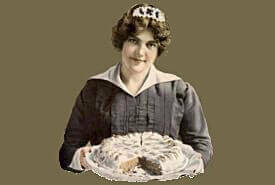 Commemorative royal cake recipes became common in the nation's kitchens throughout the 1800s and early 1900s. Ancestors of our Canadian Royal Family were honored by having various food items named after them, including desserts and dessert cakes. Don't be misled, these are fine, rich-tasting cakes that you'll find suitable for any occasion and perfect for serving at holiday events and parties. They are bound to create interest and conversation. 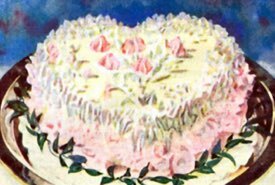 This royal cake recipe from the Victorian Era makes fancy, tiny cakes that are perfect for serving at parties, or an afternoon tea. 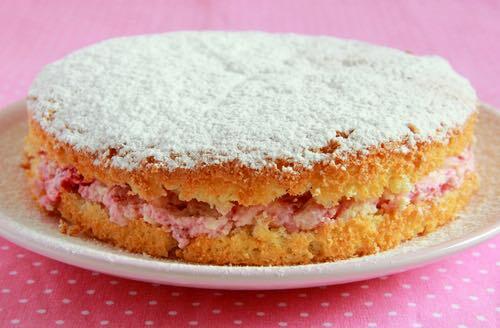 The old fashioned sponge cake recipe can also be used to make a single Victorian sponge, if preferred. A Victoria sandwich cake is simple to make, but it is finicky concerning cooking time and oven temperature, so keep a close eye on it while it's baking. Also, since its unique lightness comes from the air trapped within the batter, don't skimp on the time spent in beating. 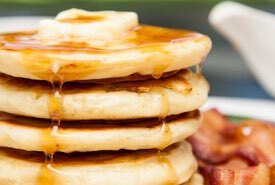 Ingredients: 6 ounces of flour, 4 ounces of granulated sugar, 2 ounces of butter, 3 eggs, 1 teaspoonful of baking powder, a little milk, jam of your choice, pinch of salt. Method: Stir the sugar and yolks of eggs together until thick and creamy, then add the butter melted. Pass the flour, baking powder, and a good pinch of salt through a sieve, stir it lightly into the rest of the ingredients, and add milk by degrees until the mixture drops readily from the spoon. Now, whisk the whites of eggs stiffly, stir them in as lightly as possible, and pour the preparation into a well-buttered pudding tin. Bake in a moderately hot oven for about 20 minutes, let it cool, split in halves, spread thickly with jam, replace the parts, and press lightly together. Cut into finger-shaped pieces, arrange them in groups of three, letting the layers cross each other, sprinkle liberally with granulated sugar, and serve. One half cup butter, 1 cup brown sugar, 1 egg, 1 cup raisins (which have been boiled), 2 tablespoons molasses, 1/2 teaspoon each of cinnamon and cloves, 1 cup sour milk, 1 teaspoon baking soda, 1 teaspoon vanilla, pinch of salt, 2 cups flour; bake in moderate oven about 20 minutes. 1/2 cup butter, 1 cup brown sugar, 3 eggs well beaten, 2 cups flour, 1/2 cup sour milk, 1 teaspoon soda, 1 teaspoon cinnamon, 2 tablespoons molasses, 1 cup raisins (boiled in hot water). Mix as usual. Put raisins in last of all. Mix the flour, cornflour, and baking powder together, beat the butter and sugar to a cream, beat in the egg, flavoring, and milk, then the flour, &c., and continue to beat for five minutes. Butter some small bun tins, half fill them with the mixture, put into a moderate oven and bake for about twenty minutes; stand on a sieve till cold. 10 ounces flour, 3 ounces sugar, 3 ounces butter, 2 eggs, 1/2 gill milk, 1 teaspoon baking powder, rind of 1/2 a lemon, 1 ounce candied peel. Rub together the flour, sugar and butter, add grated lemon rind, and baking powder. Beat the eggs and mix them with the milk. Mix all together, drop in small pieces onto a buttered pan, and bake in good oven fifteen minutes. The candied peel should be cut into slices, and one slice placed on each bun before baking. The Queen Victoria Cakes were named to honor Her Majesty Queen Victoria (1819-1901) who reigned 63 years as Queen of the United Kingdom and the British Dominions, and almost 25 years as Empress of India. 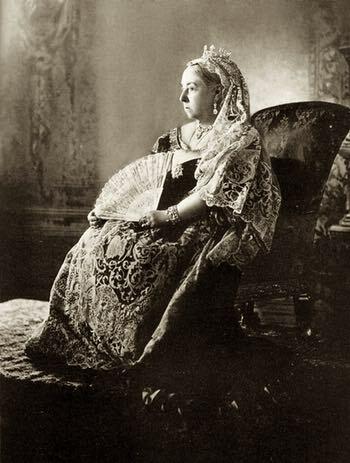 The photo above was taken to commemorate her Diamond Jubilee in 1897. The Prince Albert Cake was named to honor HRH Prince Albert (1819-1861), The Prince Consort and beloved husband of Queen Victoria. 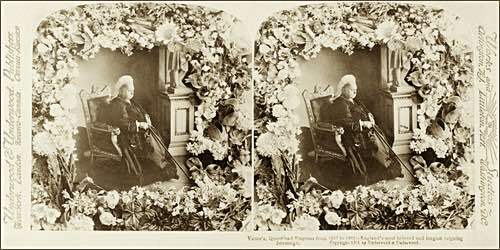 Both the Prince of Whales Cake and the King Edward Cake were named to honor Queen Victoria's eldest son, His Majesty King Edward VII (1841-1910), formerly the Prince of Whales who reigned 9 years after his mother, Queen Victoria. The decadent taste of this moist dessert cake with its dates, nuts, and caramel topping might remind you of Britain's beloved sticky toffee pudding. 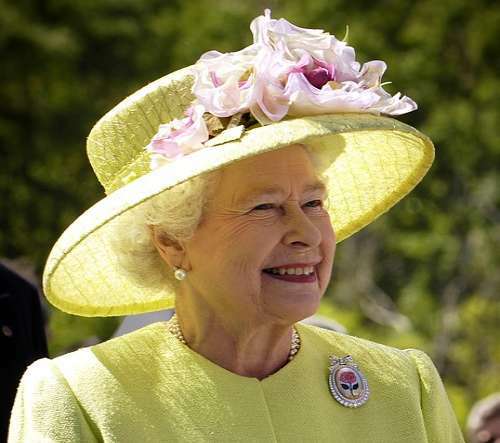 The Elizabeth Cake recipe became very popular in Canadian kitchens when Her Majesty Queen Elizabeth II was crowned in June 1953, but it was also associated with Queen Elizabeth the Queen Mother's 1939 royal tour of Canada. The cake was said to have been made by the Queen herself, but there is no proof to the rumor. 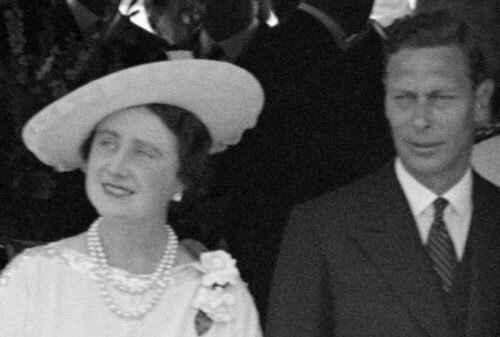 So, the origin of this royal cake recipe remains a mystery. Pour boiling water over chopped dates in a bowl, stir in the baking soda, and set aside until the following ingredients are prepared. In a large bowl, mix sugar, butter, eggs, and vanilla together until smooth and light. Fold in sifted flour, baking powder, and salt. Add chopped nuts and the date mixture. Stir until batter is smooth. Scrape batter into a greased 9x13-inch cake pan and bake at 350°F for 35 to 40 minutes, or until the cake tests done when a skewer inserted in the center comes out clean. Remove from oven and let cool. Ice using the recipe below. Gently boil brown sugar, butter, and cream together in a saucepan for about 3 minutes. Spread evenly over cake, then sprinkle with coconut. Let cool. Cut in squares for serving. The April 29, 2011 wedding of Prince William, Duke of Cambridge, and Catherine Middleton captured the public's attention and featured two memorable dessert cakes. The royal couple's wedding cake itself was a stunningly beautiful eight-tiered traditional fruitcake with cream and white icing designed by pastry chef Fiona Cairns. The royal wedding cake recipe was published by ABC News. However, Prince William requested that a groom's cake should also be served to invited guests at the Buckingham Palace reception. The now-famous dark chocolate biscuit dessert cake is a favorite of William's, and his grandmother (Queen Elizabeth II) is said to be quite fond of it too. The actual royal cake recipe, though, remains a palace secret. As maker of the groom's cake and owner of the McVities's® brand, the United Biscuits Group did reveal that around 1700 McVitie's Rich Tea Biscuits and over 37 pounds of chocolate were used to make the royal cake cut in a few hundred slices for serving at the palace. The proper ingredient ratio is 50 biscuits to around one pound of chocolate. This makes for a deliciously rich-tasting dessert cake. Well, my adapted version of the royal biscuit cake won't require 37 pounds of dark chocolate nor will it feed several hundred. But, it will richly serve about 6 to 8 people, depending on how you slice it. The royal cake recipe calls for McVitie's® Rich Tea Biscuits which you'll find displayed for sale in local supermarkets, likely in the international food section outside the United Kingdom. And make no mistake, McVitie's® ARE "rich" tea biscuits. The average biscuit (8.3 g) or cookie contains 40 calories! Another brand of tea biscuits may be substituted such as Mr. Christie's® Social Tea® or Marie should you be unable to find the real thing. Line the bottom of 7-inch nonstick springform pan with a circle of parchment paper cut to size, to permit easy release later. Butter sides of cake ring. In medium bowl, cream butter and sugar until fluffy. In top of double boiler, melt chocolate while stirring constantly. Stir in creamed butter mixture. Stir in beaten egg. Remove mixture from heat and gently fold in broken biscuit pieces, stirring until the pieces are all well coated. Carefully spoon the biscuit mixture into prepared cake pan, filling all gaps on bottom of ring (it'll be the cake top when unmolded). Cover with waxed paper and refrigerate at least 2-1/2 to 3 hours, until chilled and firm to the touch. Remove cake from refrigerator. Remove ring from springform pan. Turn cake upside down onto a cooling rack placed over a parchment-covered baking sheet. Remove springform bottom and parchment paper. In top of double boiler, melt dark chocolate for icing while stirring. Slowly pour the melted chocolate over cake, filling crevices and using a spatula to smooth both top and sides of cake. Let cake sit at room temperature until the chocolate icing is firm, at least 1 hour. Carefully run knife around bottom edge of cake to release it from the cooling rack, then carefully transfer cake to serving dish. Melt the white chocolate and drizzle it in a decorative pattern of your choice on top of the cake. Note: The royal cake recipe adaptation above makes a non flour chocolate cake that's unlike a regular cake. It's very firm and not always easy to cut without it cracking, so it's more like a thick chocolate bar than a normal cake. Some cooks recommend adding an additional tablespoon or two of butter if you prefer a softer texture that's easier to slice. Mom's old scrapbook contains newspaper clippings of another royal wedding that took place before the days of television, back when the newspapers and radio broadcasts were the popular media for reporting on world events. And a royal wedding was a huge event in Canada and throughout the British Empire at the time. People wanted something upbeat to focus on that would help lift their spirits during the height of the Great Depression in the 1930s. 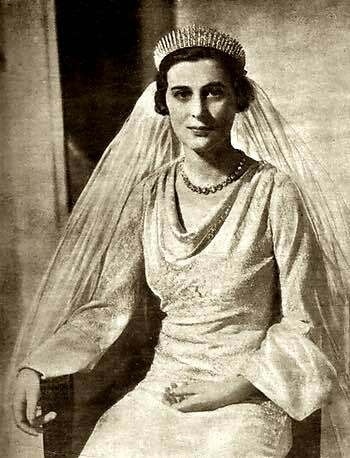 The marriage of the Duke of Kent (youngest son of King George V and Queen Mary) and Princess Marina of Greece and Denmark took place at Westminster Abbey on November 9, 1934. Afterwards, a formal wedding breakfast was held in the State Apartments at Buckingham Palace where guests could at last view the magnificently ornate wedding cake in all its towering glory as pictured at the left. "A feature of the brilliant wedding reception will be Princess Marina's favorite cake, called Bakhlava, which is said to bring good luck to the bride and family if given by friends. 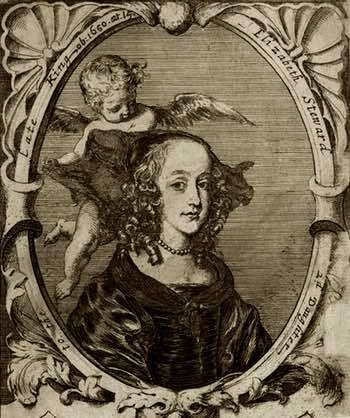 Lady Elizabeth Stuart (1635-1650) was the second daughter of England's King Charles I and Queen Henrietta Maria. At the age of six, the princess became a prisoner of Parliament on the outbreak of the English Civil War in 1642. Afterwards, she had very limited contact with her father, King Charles I.
Elizabeth tearfully saw her father for the last time on the eve of his execution in 1649. Just twenty months later, at the young age of 14, she died from pneumonia and was found with her head resting on the Bible her father had given her at their last meeting. The historical royal cake recipe that follows is believed to be from the personal recipe collection of Queen Henrietta Maria of England. Do feel free to consult my Glossary of Renaissance Cooking Terms for help with the outdated cooking terms and methods, if needed. the Lady Elizabeth, daughter to King Charles the firſt. Take half a peck of Flower, half a pint of Roſe-water, a pint of Ale yeaſt, a pint of Cream, boil it, a pound and a half of Butter, ſix Eggs (leave out the whites), four pound of Currans, one half pound of Sugar, one Nutmeg, and a little Salt, work it very well, and let it ſtand half an hour by the fire, and then work it again, and then make it up, and let it ſtand an hour and a half in the Oven; let not your Oven be too hot.